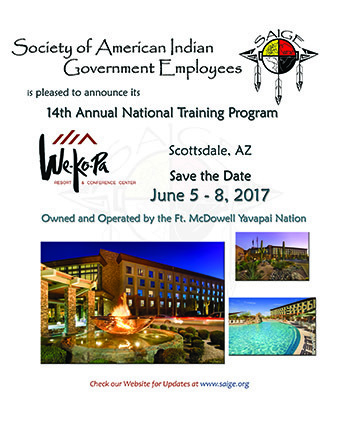 SAIGE Chair Fredericka Joseph has announced that We Ko Pa Resort and Conference Center in Scottsdale, AZ has been selected for the 2017 SAIGE National Training Program. The dates will be June 5-8, 2017. We are pleased to announce the final agenda for our 13th Annual National Training Program. Please Click HERE to download it. NOTE: REMEMBER TO RESERVE YOUR HOTEL ROOM BY MAY 15 AND REGISTER FOR THE NTP NO LATER THAN MAY 27! This new draft agenda is very close to being final! We are excited that things are coming together so well and we have a list of outstanding speakers and topics to offer this year, as in the past. Click this link to download the 4-27-2016 version of the Draft Agenda for the SAIGE National Training Program. Don’t forget to make your hotel reservations by May 15 to get the government per diem rate. Thank you for your patience in waiting for the agenda to be posted. Some people are not confirmed, but this is our DRAFT agenda as of April 7, 2016. Updates will be posted periodically as we near the date of the Training Program. SAIGE Provided the following press release announcing its 13th Annual National Training Program. Click HERE to download and please circulate it to your own contacts – thank you! The SAIGE Board of Directors is happy to announce that registration for the 2016 Annual National Training Program, “Serving Our Nations,” is now open. It will take place at the Hard Rock Hotel in Catoosa, OK (Tulsa area) June 6 – 9, 2016. Complete information is available on the Registration website including registration fees and deadlines, and hotel reservation information. The Planning Committee is working hard to create another stellar agenda for this 13th Annual Training Program that you will not want to miss. As more speakers are confirmed we will post a draft agenda on the registration site and on the SAIGE Website. Please make your hotel reservations at the Hard Rock as soon as possible, as the deadline to ensure government per diem rates is May 15, 2016. If your agency or organization is interested in partnership opportunities, exhibiting, or to sponsor students to the Youth Leadership program, please contact our Partnership committee at partnerships@saige.org. Contact for questions: secretary@saige.org. Thank you for your support of SAIGE and we look forward to seeing you there! 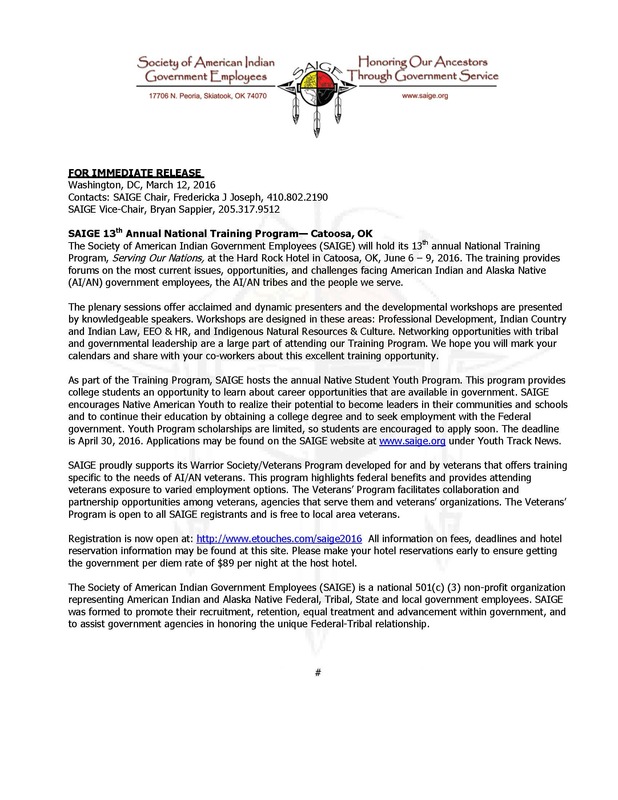 SAIGE is proud to announce that applications are now being accepted for the 2016 Native Student Youth Program, to be held at the National Training Program June 5-9, at the Hard Rock Hotel in Catoosa, OK. Students 18 – 25 years old are invited to apply. Further eligibility requirements are available in the application. Amazon has accepted the Society of American Indian Government Employees to its Amazon Smile Program. Amazon will make a donation of 5% of all eligible purchases to SAIGE. It is a simple process and there is no cost to you. So if you use Amazon for your shopping here is a way it can benefit SAIGE. All you need to do is go to www.AmazonSmile.com At the top of the page it will ask you to enter your Charity, just type in Society of American Indian Government Employees and click and you are ready to shop. If you have an Amazon account (like Amazon Prime) you can login after you select the Society of American Indian Government Employees as your charity. You only need to add the Society of American Indian Government Employees information one time. After that just login to your Amazon account and shop away. Please share this information with family, friends and associates as this partnership will assist us in meeting SAIGE’s mission and goals of outreach to the community. On October 30, 2015 President Barack Obama issued this Proclamation designating November as Native American Heritage Month. Combined Federal Campaign Season is upon us! You may have noticed that Federal Executive Boards and agencies are starting to send out announcements for events and activities to promote the Combined Federal Campaign (CFC). These activities are to introduce federal employees to participating non-profit organizations that they can support, either by setting up a recurring payroll deduction or a single donation during 2016. The opportunity to sign up for CFC donations generally runs from September until December 15. SAIGE again is on the CFC for the upcoming 2016 donation year, and our number is 26052. We thank you all for your support, as these funds help us strengthen our organization and bring you the premiere National Training Program that is unique in the Federal sector. We encourage you to participate in the CFC, whatever charities(s) you support. We hope you will consider SAIGE when making your decision to participate in the 2016 CFC.